We don’t believe you need to add more weight to your key ring. With this special offer, you can, not only secure your gooseneck trailer, but three other equipment or tack containers as well. 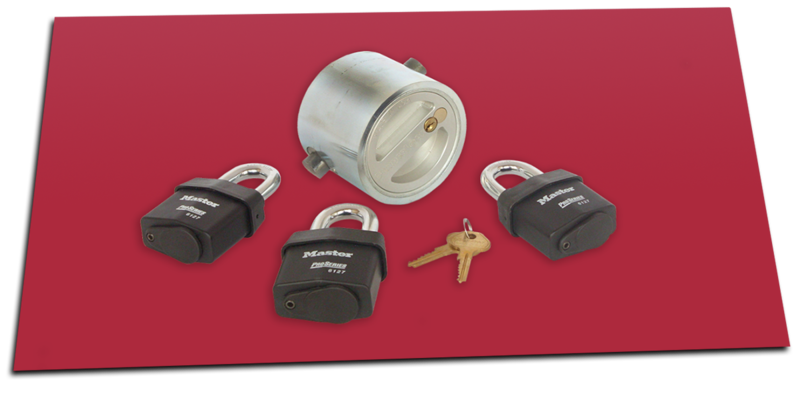 All four locks use the same key, thus keeping the weight where it does the most good – securing your valuables! You’ll also receive a duplicate key for a partner or “better half”. While we keep sets of up to 5 GanderLocks in stock, we can build as many as you like with the same key! • Less than two minutes to remove coupler and install lock. — Tested! • Equal amount of time to reverse the process. • Works with any trailer using a bulldog coupler with round receiving tube. • Square locks will be available soon.